Exporters yesterday urged the Government to deal with dollar earnings kept overseas on a case by case basis without making “knee jerk” policy decisions that could upset the regulatory framework and send mixed signals to investors. Exporters had aired their concerns during a meeting with Prime Minister Ranil Wickremesinghe on Saturday just a day after the Central Bank announced new policy measures to push exporters to bring all their earnings immediately to Sri Lanka by freezing a rule brought in 1993. “We met with the prime minister to voice our concerns. The Government has not specified how much money is kept out of the country and we have been given no indication. If indeed large amounts of foreign exchange are being kept overseas then it should be calculated and companies responsible should be approached directly on a case by case basis,” a top exporter told the Daily FT. He added that changing policies without any discussion or engagement with stakeholders would discourage the sector and send out the wrong signals to the local and international investment community. The move to pressure exporters to bring foreign exchange immediately to Sri Lanka is unlikely to impact top apparel export companies as they regularly bring in their dollar earnings voluntarily, the source noted. However, the fresh policy comes as the rupee continued to trade at Rs.145 on Friday having dipped from about Rs.135 since September last year. 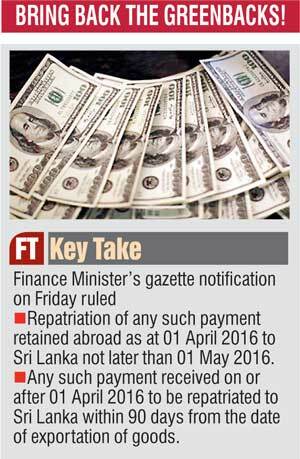 “As part of current policy measures taken to improve the foreign exchange inflows to the country, the Minister of Finance has issued the Gazette Notification (Extraordinary) No: 1960/66 dated 01 April 2016 repealing the exemption granted in respect of payment for goods exported from Sri Lanka in the Extraordinary Gazette Notification No. 759/15 dated 26 March 1993,” the statement released by the Central Bank said. It also demanded repatriation of any foreign exchange kept outside of Sri Lanka, to be returned before 1 May 2016. Under the fresh measures all foreign exchange payments should be brought to Sri Lanka within three months.